We all have those people who are either really easy, or really difficult to buy for. Sometimes, we just need a gift for everyone that will fit no matter who we are trying to buy for. The first thing that always comes to my mind when this is the case is a watch. No matter what age, from teenagers to mature adults, everyone can use a watch. Okay… so I am leaving out little kids. But ALMOST everyone on your list can be covered with a nice watch. Some people might use them on a daily basis, while others may only wear them to work, school, or for a special occasion. *This post was done in collaboration with JORD wood watches. Sometimes products are sent to me in exchange for my honest review. As always, I would never recommend something to my readers that I do not use and love myself. 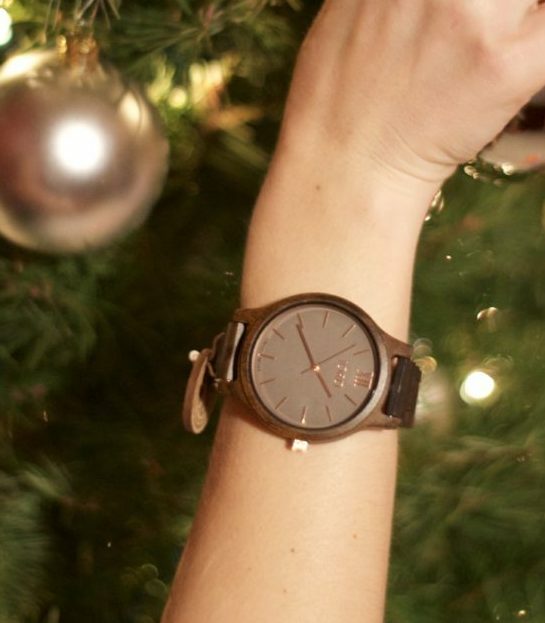 JORD wood watches have quickly become some of my favorite things to give as a gift. Their style is so elegant and unique, and I love how it is suitable for so many different styles. If you were buying for a woman or a teenage girl, they have beautiful watches in rose and pink colors that are elegant and classy, but also trendy and on style. If you are buying for that significant other, or someone important to you in your family, they have amazing watches that are extremely unique, in a variety of colors, that would make the perfect “wow” gift. 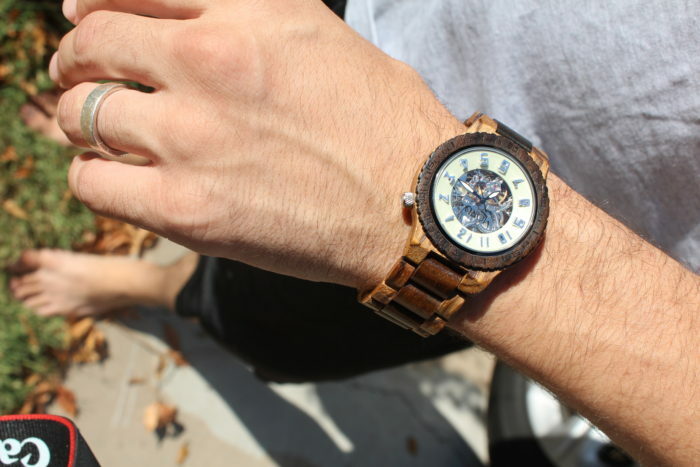 This “dark sandalwood and smoke” watch is one of my favorites from their collection right now. If you are trying to find something for the manly man, their watches that feature gears in the face with a larger build to them would be the way to go. I gave one of these to my husband for his birthday this past summer, and he has worn it nearly every day! It still looks brand new and he can wear it with so many different outfits. I love their selection of men’s watches! JORD now has gift cards as well, which would be perfect to add into stockings, give to coworkers or clients that you want to send a little something to, but don’t want to be too specific about their likes. Gift cards allow them to pick out something that is more their style. Check out our other gift guides for him, gifts for her, and gift ideas for wine lovers and beer drinkers here. P.S. JORD is a part of our HUGE Blogmas Giveaway happening right now, worth over $1000 in cash and prizes! Head over to this post to enter. Will you be giving a watch to someone this holiday season? Ive been seeing these watches every where!! They are so pretty. 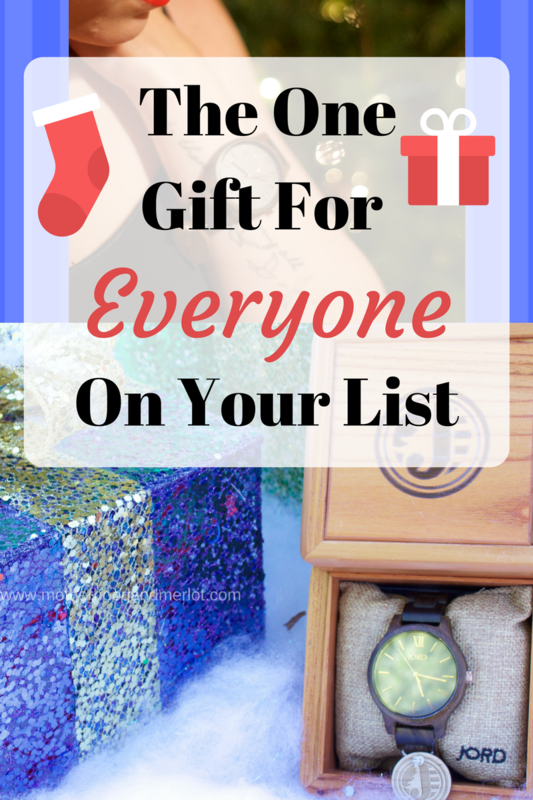 It really is true that you can get a watch for almost every single person on your list…even kids love watches! Mama Munchkin recently posted…The Ultimate Holiday Gift Guide 2016- something for everyone on your list!